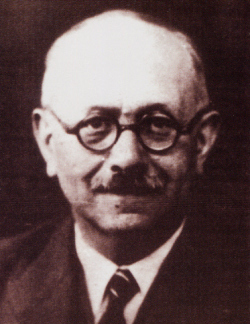 On this date in 1944, the Gestapo shot French historian Marc Bloch among a batch of Resistance members. When war broke out between France and Germany in 1939, the 52-year-old professor spurned advice to get out of the country. Driven by his love of France, he resigned his post at the Sorbonne to join the reserves. I was born in France, I have drunk the waters of her culture. I have made her past my own. I breathe freely only in her climate, and I have done my best, with others, to defend her interests. High-profile intellectuals of Resistance proclivities and Jewish extraction, needless to say, had a problem in those terrible years. The remarkable Bloch almost made it through the whole of the war in the French Resistance, but was arrested a few weeks before the Allied landing at Normandy, tortured, and shot. Comrades in arms remembered his death as an unusually sobering loss. We couldn’t, no we couldn’t bear that image: Marc Bloch, our “Narbonne” of clandestine life, turned over to the Nazi beasts; this perfect exemplar of French dignity, of exquisite and profound humanism, this spirit become a prey of flesh in the vilest hands. We were there, a few of us, in Lyons, his friends, his comrades in the clandestine struggle, when we learned of the arrest, when we were immediately told that, “They tortured him.” A detainee had seen him in the offices of the Gestapo, bleeding from the mouth (that bloody trail in the place of the last malicious smile he had left me with on a street corner before being caught up in the horror). I remember: at those words, “He was bleeding,” we broke out in tears of rage. The most hardened lowered their heads despondently, as we do when things are just too unfair. For months we waited, hoped. Deported? Still in Montluc? Transferred to another city? We didn’t know anything until the recent day when we were told, “There’s no more hope. He was executed at Trévoux on June 16, 1944. His clothes and papers were recognized.” They killed him, alongside a few others who he inspired with his courage. * The blog To The Roots is in the midst of a series of posts exploring The Historian’s Craft.